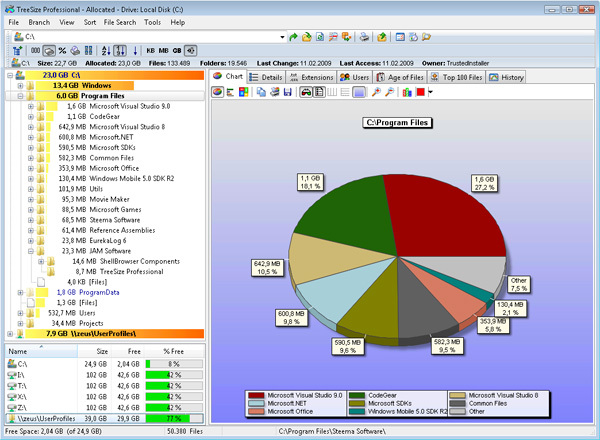 Powerful and flexible hard disk space manager for Windows. For each folder, TreeSize Professional shows you the size, allocated and wasted space, number of files, 3D charts, last access date, file owner, permissions and more information. The results can be printed or exported to Excel, HTML, XML or ASCII. It also lets you search for old, big, obsolete and duplicate files on entire servers. Unicode and scheduled scans are supported. TreeSize Professional also lets you search drives, entire servers or the entire network for old, big, temporary and duplicate files. The search results can be moved, deleted or exported. TreeSize Professional has an intuitive Explorer-like user interface, it is fast and multi-threaded and supports Unicode and scheduled scans. You can print detailed reports or export the collected data to Excel and to an HTML, XML or text file. TreeSize Professional can be started from the context menu of every folder or drive. Professional Bartender shows you lots of popular and classic drink recipes. Label Spirit allows you to print professional barcode labels. RunAs Professinoal solves the password problem of normal runas. FlashPoint Professional.Supports PowerPoint 2007 now. A professional data backup software for Windows and Windows Server. X-Copy Professional. Copy CDs/DVDs with easy. Qweas is providing links to TreeSize Professional 5.4.2 as a courtesy, and makes no representations regarding TreeSize Professional or any other applications or any information related thereto. Any questions, complaints or claims regarding this application TreeSize Professional 5.4.2 must be directed to the appropriate software vendor. You may click the publisher link of TreeSize Professional on the top of this page to get more details about the vendor.